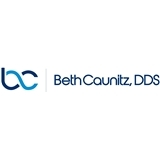 Beth Caunitz, DDS (New York) - Book Appointment Online! We Love What We Do! Dr Caunitz has been in private practice for the last 25 years. She specializes in cosmetic dentistry, implant placement and restoration, veneers, invisalign, as well as traditional restorative dentistry. She is a member of The American Academy of Sleep Dentistry and makes appliances that stop snoring and help her patients get more sleep! We believe one smile can make all the difference in the world and we are dedicated to having Happy Patients with Beautiful and Healthy Smiles.